If you were lucky enough to get your hands on one of the first versions of the Printrbot Metal Plus printers, model 1504, you are probably a very happy person. These printers are such a huge improvement from the previous wooden Printrbot Plus versions given their rigidity from the metal frame and experiencing-altering upgrades such as an auto-leveling bed. 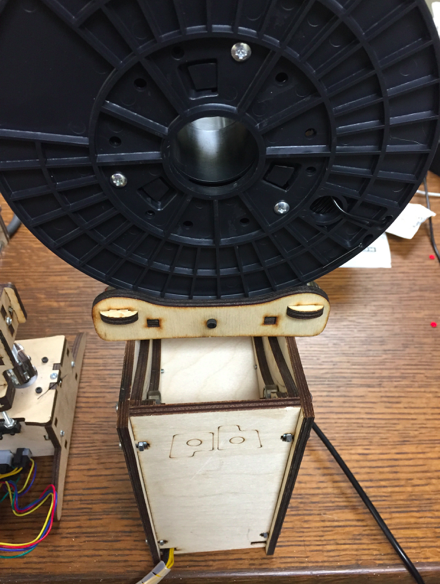 But, if you have one of these Printrbot Metal Plus printers, there are three modifications that are critical. If you bought your printer in June 2015 or later, these modifications should already be included in your kit or built Printrbot Metal Plus. If you bought your bot prior to June 2015, you should definitely check and order these (some free) upgrades from Printrbot if you don’t have them on your machine! Note that the first two upgrades are specific to the Printrbot Metal Plus, but the third (extruder) upgrade is something that anyone with a metal Printrbot printer (especially the Printrbot Metal Simple) should be looking to do as an upgrade. What happens when you bend a copper wire over and over and over? It snaps and breaks! That is a fairly common issue with all 3D printers, that wires can break after enough repetitive bending. Wires need to be flexible and move somewhat as the extruder moves in multiple axes. The way to minimize or eliminate this threat of breaking wires is to have your wire bend over a longer length (less sharp angle) and not have a tight bend anywhere that is flexing. The free wire relief kit from Printrbot consists of a new bracket that holds your extruder/hot end, z sensor and extruder stepper motor. The kit is a bit time consuming to install as it requires dismantling your extruder completely. 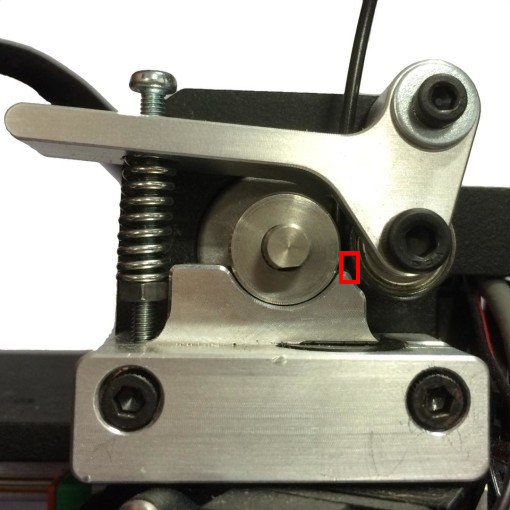 The most important part of the kit is a somewhat flexible plastic bracket that guides all wires at a 90 angle from the back of the extruder bracket, therefore eliminating any sharp angles that tend to put stress on you extruder wires. 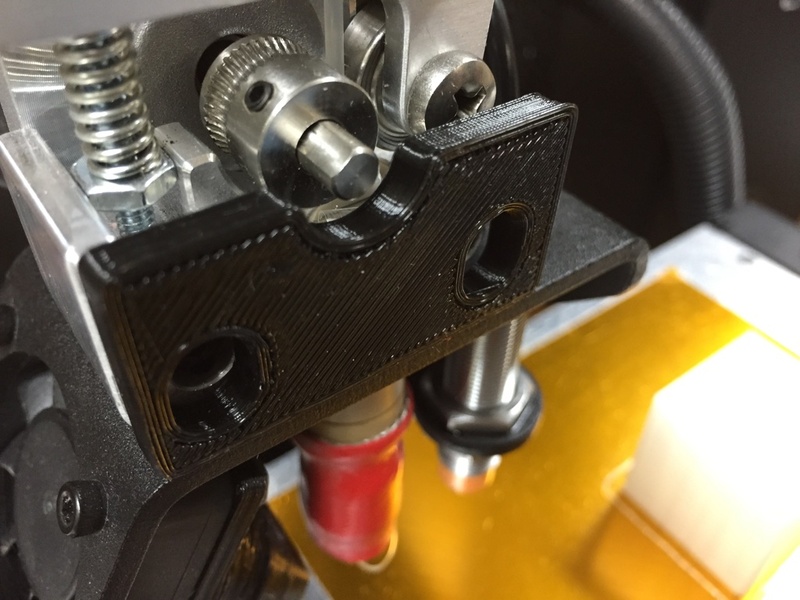 Note that a variation of this kit is already included in the Printrbot Metal Plus dual extruder upgrade kit and contains the flexible plastic bracket to ensure the optimal mounting of wires leaving the extruder bracket. 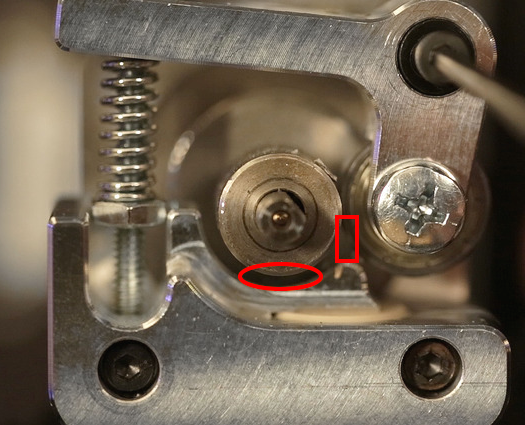 In this second sketch you can see the fix when the free spring and screw kit is installed. Longer screws are tightened against springs, which still keeps the bracket tight, but allows for a slight bit of movement given the slightly oversized holes in the frame, which allows for enough movement to accommodate the build plate’s expansion and contraction: The fix only took about 30 minute to install. Most of the time was removing the many screws to take the bottom off the Printrbot Plus Metal. And the repair kit completely fixed the Y axis drifting issue. BTW, this is just an issue for Printrbot Plus Metal printers that were shipped through spring of 2015. New Printrbot Plus Metals that are shipping today already incorporate the spring and screw kit. There are workarounds to print flexible materials, mostly in the form of guides that provide some rigidity to the filament after leaving the drive gear, but none of them are as reliable as upgrading to this V2 extruder.One fun fact, there is a special version of the V2 extruder that has a shorter top aluminum arm. You can see the spring arm (where you press with your thumb to release the spring and load or unload your filament) is longer on the v2 extruder. I would assume that is longer so it is easier to press the lever on the V2. 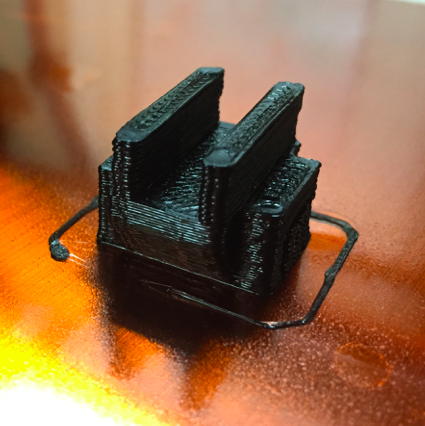 However, if you have a dual extruder setup, you need to order the special V2 extruder that has a shorter arm so it does not interfere with the tighter dual extruder setup. 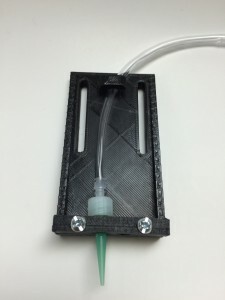 I am the 79th backer on Kickstarter for the Structur3D Discov3ry paste 3D printer extruder. 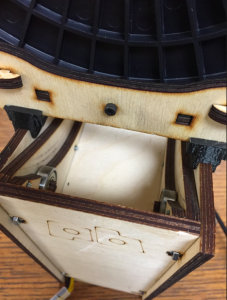 I originally saw the extruder at at the MakerFaire in 2014 in San Mateo, CA. I immediately realized that its ability to print paste materials would greatly expand what I could print and create. I was impressed with its ability to print 3D food as well as print other flexible materials in 3D such as pure silicone, clay, etc. 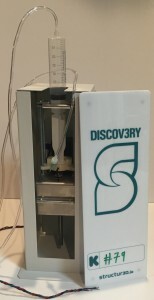 I recently (late May 2015) received my Structur3D Discov3ry paste extruder and my first impressions are that I’m impressed with the overall quality of the final product. 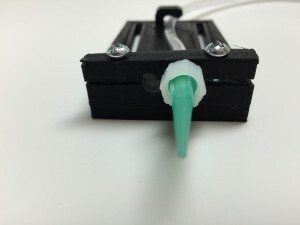 The extruder consists of a beefy metal unit that holds a 60cc syringe and, using a stepper motor like those used for filament printers, compresses the syringe to pump paste material to a paste print tip, fundamentally no different than a filament printer that extrudes molten plastic. Although I have setup my Structur3d Discov3ry extruder, I have not yet printed my first print (will be printing first print next week). I have spent a lot of time configuring/attaching/preparing my paste extruder and want to share my experience so far to help those with Printrbot printers. 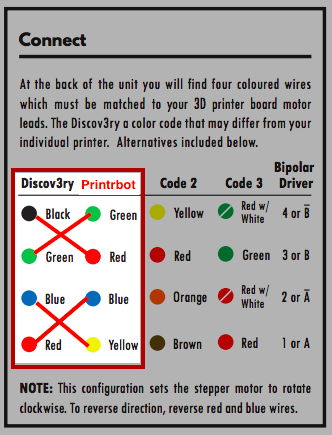 With this Structur3d Discov3ry paste extruder being so new, we’re all blazing new ground, so I want to share this information quickly to help others with Printrbot printers. The guys at Structu3D are awesome, and with their help we figured out the wiring for Printrbot printers. However, you first need to decide if you are going to make your machine a dual extruder (one extruder being a paste extruder and one extruder printing filament) or single extruder. 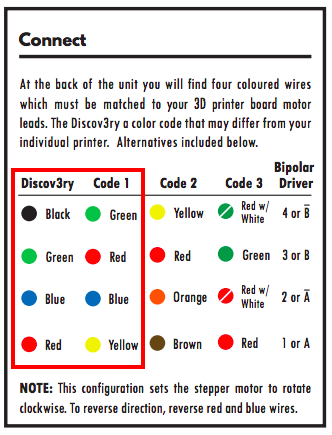 In order to go the dual route, you need to make sure your printer’s board/electronics supports dual extruders. 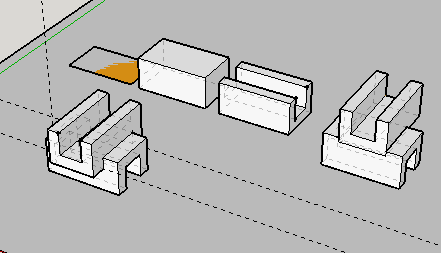 Alternately, you can create a single extruder setup where you configure your extruder wiring to allow different extruders to be unplugged and replugged when switching between your filament extruder and paste extruder (my preferred approach). 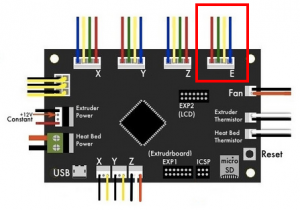 In this approach, both extruders can be physically mounted to your printer, but only one will be plugged into your printer’s board at a time and therefore only one will be active at a time. 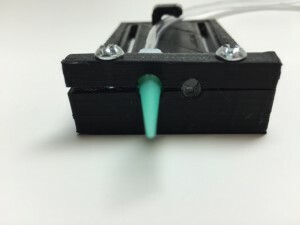 There is no need to unmount your paste extruder when it is not active if your mount is lightweight and not too bulky and does not get in your way while filament printing. In the spirit of getting the extruder up and running, more quickly, I just unplugged my filament extruder and plugged the Discov3ry extruder directly to the Printrbot printer board. I bought the OSEPP I2C Bus Cable from Fry’s and soldered the 4 Structur3D Discov3ry stepper motor (extruder) wires to the Fry’s connector. 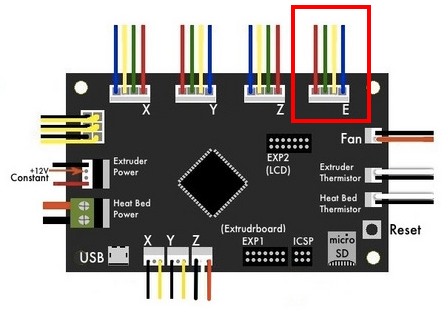 Long-term, I want a female plug mounted on the exterior of my printer that allows my Printrbot filament and Structur3D Discov3ry paste extruders to be connected and disconnected easily without opening up and accessing my printer’s board. Short-term, I have the bottom off my printer and I plug and unplug extruder connection plugs as needed. 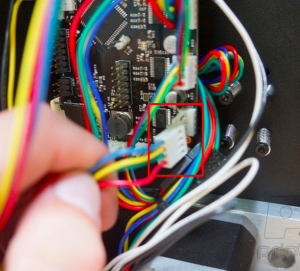 Obviously, make sure your printer is turned off whenever you are unplugging and plugging plugs into the Printrboard. The paste extruder has a plastic tip that connects to the end of a flexible plastic tube. In order to print using this extruder, you need to find a way to mount the tips on your printer. 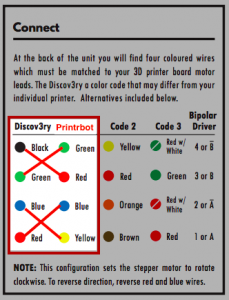 I tried, but could not find an existing community-created paste tip mount for the Structur3D Discov3ry paste extruder for any Printrbot printers. I checked the Structur3D Discov3ry forums as well as the usual 3D model sharing sites including thingiverse.com, youmagine.com, myminifactory.com, etc. I didn’t find anything that existed, so I designed my own mount for the Printrbot Metal Plus as well as an adapter that allows it to work properly on the Printrbot Metal Simple. My mount 3D models are available on thingiverse.com. 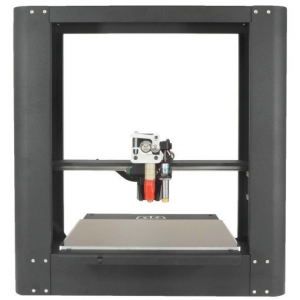 Want mount’s height to be adjustable and use existing screw holes on printer (you will need longer M3 metric screws which you can get from small hardware stores in US, but not the big box home stores in US). Want it to be sturdy and not unnecessarily vibrate or bend, so don’t go too thin. 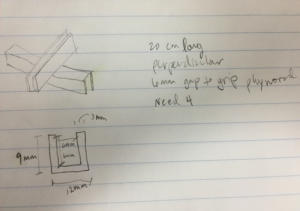 My design is 6mm thick and has vertical support rails to provide rigidity. Want the paste tip mount to be adjustable to allow paste tip to be positioned properly (related: see #4 below for more details on offsetting print head). Want mount to be super adjustable so it can be positioned out of the way while using the filament extruder, so it can be mounted on printer even using filament extruder. 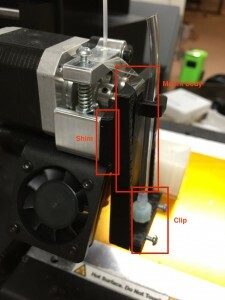 Want options in clamping the paste plastic tubing or paste tips to the mount while allowing fine control of the paste tip height from the print bed. Just like filament, I’m anticipating the paste tip’s distance from the bed will be critical for a good print. Mount body – the major body of the mount that screws to the Printrbot using existing screw holes and longer M3 metric screws. Required by both the Metal Plus and Metal Simple. Clip – this piece is screwed to the mount body using 6-32 x 1/2″ machine screws. The clip is what clamps the paste extruder tube or paste tip to the mount body, allowing it to be held firmly in place. It takes some force, but you can drive the 6-32 screws through the clip and into the mount body. The screws will carve threads into the mount body screw holes. You may want to use a drill or screw gun to drive these screws. Required by both the Metal Plus and Metal Simple. 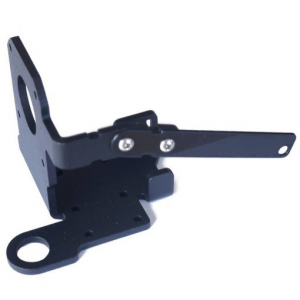 Shim – this shim has oversized holes and is positioned between the Metal Simple’s extruder and the mount body. The 6-32 screws are inserted through the oversized holes. This shim is mounted between the extruder and the mount body. This shim allows the mount body to be positioned properly due to the design of the Metal Simple’s horizontal extruder plate. Only required/used with the Metal Simple. Fill syringe: Fill the syringe with your paste material, insert the plunger and remove the air. You can use a small paperclip to break the seal of the plunger while applying slight pressure on the plunger to remove some air bubbles. Air in your syringe or tubing will result in lack of print material and will have a negative effect on your print. Attach hose: Attach a female connector to the syringe and push the tubing onto the connector. On the other side (closer to the printer), attach a male connector and screw the desired tip onto the connector. 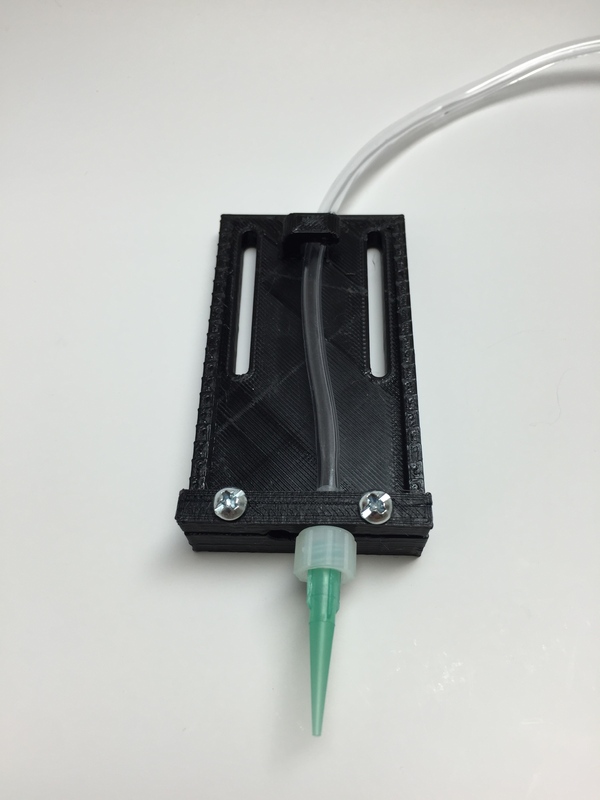 Finally, attach the hose to the syringe by screwing the syringe into the female connector. 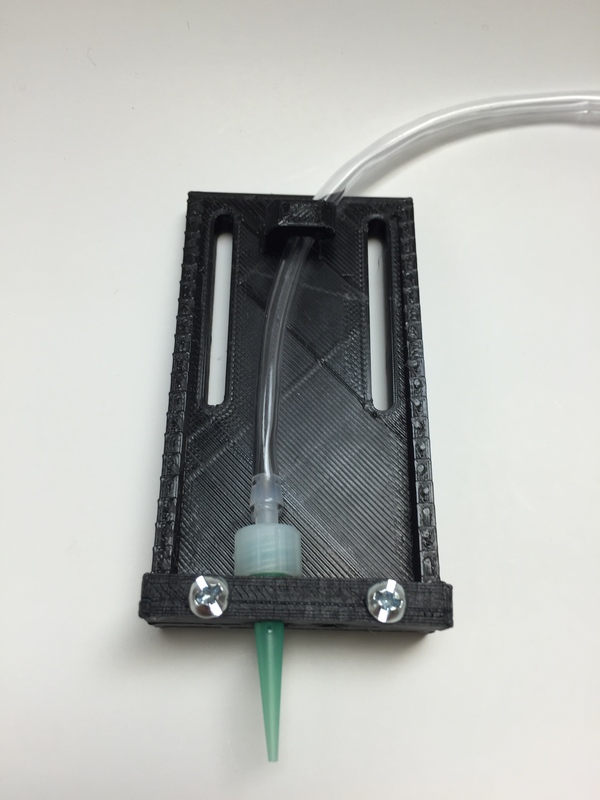 Purge the air from the line: Push on the plunger of the syringe to force paste into the tube and until it is extruding from the print tip. Mount the paste extruder tip: Secure the paste extruder tip to your paste mount on your 3D printer and secure the hose so it will not get in the way or drag in your print. 4. Adjust Z height: Again, given my goal to use my Printrbot to print both filament and paste, I’m planning to use one Z height offset to use while filament printing and second Z height offset to use while printing paste. Printrbot has documented the process (see steps 7-12) to use the M212 and M500 gcode commands to adjust the offset for your printer gantry/print head. Use M501 to find out your existing M212 Z value and write it in safe place. Then using Printrbot tutorial linked above, determine the M212 Z offset to raise the filament head about 1/2″ from print bed. Write down this second M212 Z value. 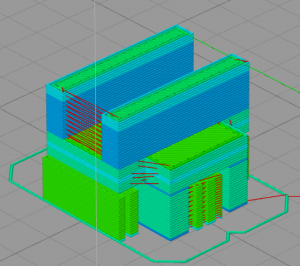 This is a the areas I’m still refining, but my plan is as follows: I want my filament extruder tip to be at its appropriate height while printing plastic filament. While printing plastic filament, my paste extruder mount will be removed from my printer or will be adjusted up so it is a 1/2 inch or so higher than the filament extruder tip. This will keep the paste extruder tip out of the way while printing plastic filament. Enter M3o2 gcode (this is temporary override and must be done each time the printer is power cycled) to disable the Printrboard’s cold extrusion safeguard. This will allow me to have my filament extruder unheated while printing paste and avoid the alternative, which is to update my Printrboard’s firmware to permanently disable the cold extrusion safeguard. Enter M92 gcode to adjust the E (extruder) steps per millimeter to be about 35000(followed by M500 to save settings) , although this is definitely a value that needs to be monitored and adjusted by the community as we get more prints done using the Structur3D Discov3ry paste extruder on Printrbot machines. Given conversations with the good folks atStructur3D, I believe 35000 is a good starting point. Note that you will need to know your original M92 E value prior to adjusting to your paste settings so you can change it back to the appropriate setting for filament printing. You can see your current M92 setting by issuing the M501 gcode command. Here are the M92 recommended settings from Printrbot in the event that somehow forget your initial value. 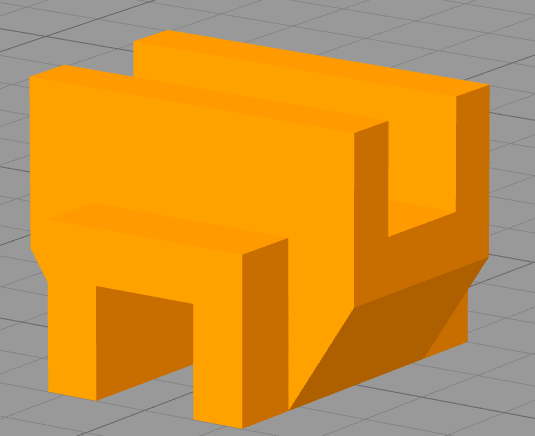 Enter the appropriate M212 gcode Z offset (followed by M500 to save settings) to bring my filament extruder tip 1/2 inch or so higher than where it is positioned to print plastic, which will ensure it is out of the way for paste printing. This will allow my paste extruder tip to be positioned lower to the bed (remember, the paste tip mount allows the tip to be raised or lowered) than the filament extruder tip while printing paste. Note that you will need to know your original M212 value prior to adjusting to your paste settings so you can change it back to the appropriate setting for filament printing. Your appropriate M212 Z offset is highly dependent on your machine and the position of your Z sensor. 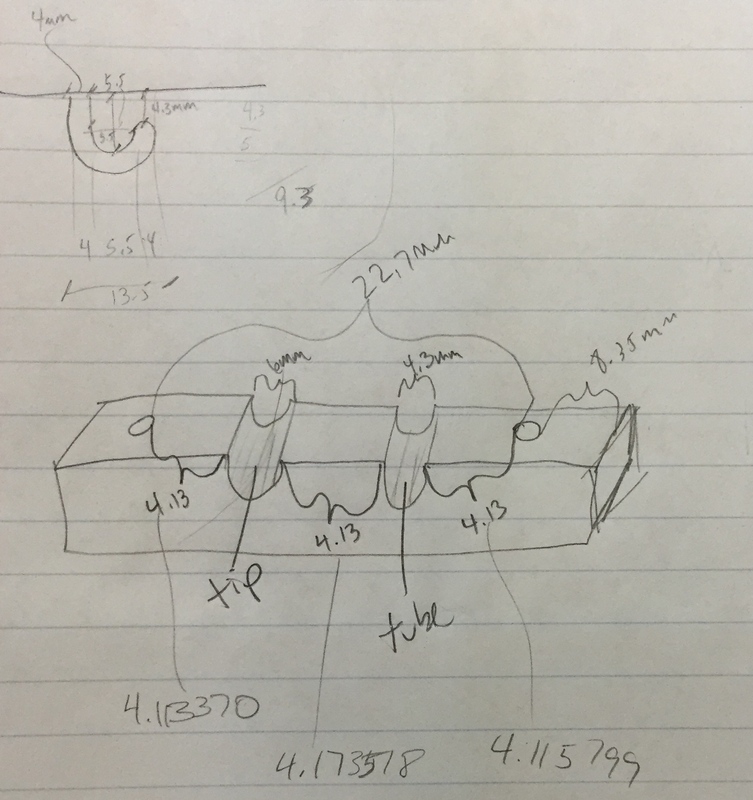 Use the M501 gcode to see your Z offset settings prior to making any adjustments. Adjust the paste mount: I’m anticipating the most difficult part of paste printing will be that the M212 offset is not put into effect until a print is started, so I will have to start my paste print with my paste extruder tip mounted about even with the filament extruder tip. I will use a skirt on all paste prints, and just as the skirt is starting to print (into the air! 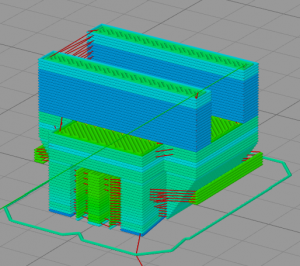 ), I will pause the the print, wipe any paste from the tip and print bed, lower my paste extruder’s tip height toward the bed to be appropriate (width of a business card from tip to print bed? ), then continue my print. I will provide updates as I get printing different pastes. I think Nutella will be my first paste material to print. Pure silicone will likely be the second paste I experiment with! Please post comments if you have any different or additional experiences to share! 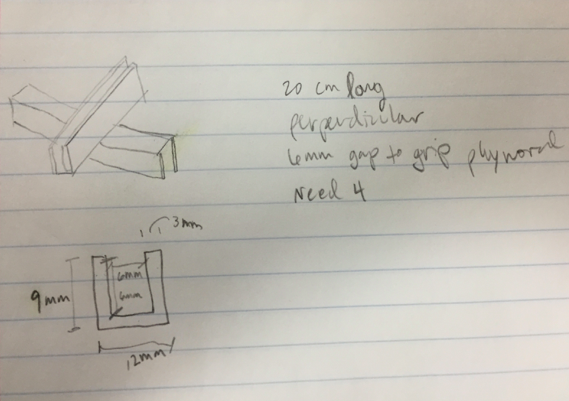 I realize that this pretty specialized, but I needed a way to connect two pieces of 5-ply 6mm birch plywood together in a perpendicular manner. Specifically, I have a Printrbot wood 3D printer and I needed a way to secure the stack of a wooden filament spool coaster/holder on top of my power tower (see pictures). Only one of the filament spools I have purchased over the last year fits into the filament coaster/holder built into the top of the power tower. So, I wanted to find a way to attach a different, adjustable wood spool coaster/holder on top of the power tower. The concept behind my design is pretty straightforward and started with this drawing. I just need two U channels set perpendicular to hold the plywood. The plywood measure about 5.8mm using my digital calipers and I believe from this measurement and from listening to an early Printrbot video that this is 5-ply 6mm birch plywood. I planned to print my final parts using PLA, which does not flex as much as ABS, so I created the clips to be approximately .2mm greater than the actual thickness of the plywood. I designed the clips to use 3mm walls and a pocket 6mm deep for the plywood. I made the length of the clip 20mm as I thought it would be long enough to provide stability. 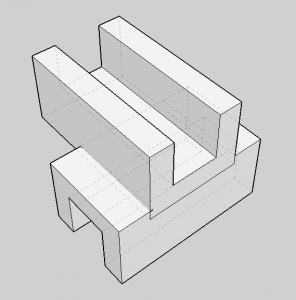 This piece requires support to print properly, so the support must be carefully removed after printing. In my case, I had to use an exacto knife and 220 grit sandpaper to remove all the support material, although it was quick and only took about 3 minutes per piece. 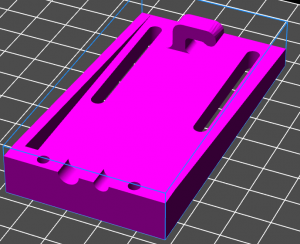 I started with a design in SketchUp that offset the two sides of the clip, but after printing, I decided a centered design would hold better as all the weight would sit squarely on the bottom of the bracket if it were centered. Here is the first design from SketchUp. 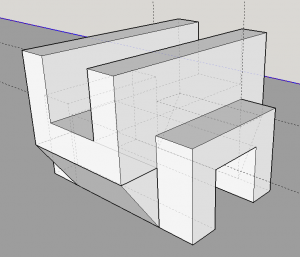 Then I moved on to a centered design, and prior to printing, noticed that support would be required to hold up the overhang and thought a more elegant design would include the support in the design. I was inspired by Clifford T Smyth’s book Functional Design for 3D Printing: Designing 3D printed things for everyday use – an engineering handbook to create better designs to make better 3D print models. Here is the default support that was required for this centered design. The colors indicates the speed of the extrusion, but some of the green (green == fast) is support as indicated by the arrows. The green support on the lower left-hand side of the image below is specific support for the overhang. 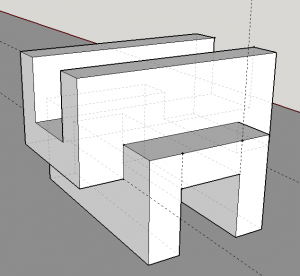 Below is the improved design (STL Download of final design) that eliminates some of the support required and, IMO, looks better with the support under the overhang. As you can see in the below image, the support for this new design is minimized, which is ideal and minimizes post print cleanup/finishing. 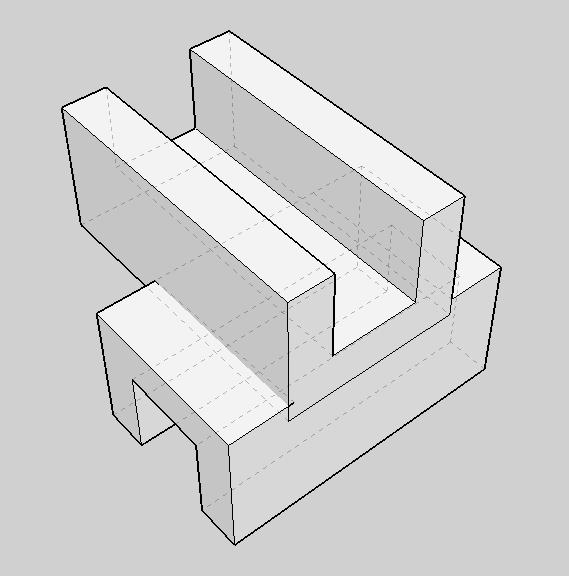 The only support material is centered in the image below. This is how the print looked on the print bed of the Printrbot. In Marcus Ritland’s book 3D Printing with SketchUp, he recommends making copies of the model every time prior to make any large modifications, that way, you can always grab the model partially through its transformation to redo an operation or generally do something different. If you don’t keep a copy of the model along the way, sometimes it can be impossible (or seem that way) to adjust your model without starting over. Here is a screenshot that shows how I created copies and therefore managed my model throughout its evolution. 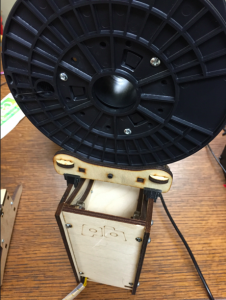 Below is a pictures of the stack of power tower and filament spool coaster/holder with the clips in place.